fairly consistent with her background and no major upheavals. Check out a hand photo of hers here. The shape of her Apollo finger shows talent and the ability to entertain and again this quality must have come from her genes (mother is an actor). However, her ability as an entertainer is limited. Her business ability is more significant. This woman can achieve a lot if she uses her ability judiciously. Paris has an amazing thumb. It’s long and well set, and this shows her willpower and reasoning abilities. People with such thumbs make excellent leaders and have the ability to think about others and do things for them. They are generous and open-minded. Her Achilles heel seems to be weak Saturn finger. With a weak Saturn, Paris would fall short of qualities like consistency, seriousness, focus and tenacity of purpose. This is probably why this talented and smart woman has not achieved more than she has. People with this combination are sensitive and do not forgive easily. They are also hypocritical and selfish and this makes it difficult for them to maintain healthy relationships. This would also affect work relationships. Ability is never nearly enough. The ability to forge relationships, being positive thinking and genuine with people goes a long way in making a person successful. By worldly standards, Paris is considered successful as she makes a lot of money, but if one thinks of her potential then she is not very successful. Her Lower Mount of Venus is developed more than it should be and while this in combination with her Moon does give her some amount of musical talent, it is more of a passion and a liking for music, rather than a significant talent. The Lower Mount of Venus also enhances physical passion. This is remarkable in her hand in the sense that it throws her personality out of balance. Usually, the development of lower mounts is accompanied by other signs which show a crude, base nature. This is not the case with Paris. The other aspects of her personality show that she has refinement and class. The way Paris holds her fingers tells us about her strong independent streak. She thinks differently from others and acts on her thoughts, at times with little concern about the consequences. Paris is a straightforward person and a good human being (shape of fingers). She has a strong humanitarian side to her personality, shown by the setting of her thumb. She has taste and class. She also has a good mind, curious and inquiring. She has discipline, if and when she chooses to exert it. This woman can do a lot with her life, but only time will tell if she actually does. 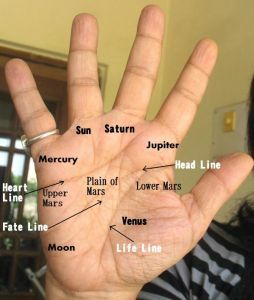 Check out the hand readings of other celebs on this website like Lady Diana, Nicole Kidman, Julian Assange, or Justin Beiber. Read about all the other celebrities on this blog, Indian and International. Padmini, yeah strange isn't it! I mean her image and what she is actually capable of. What is interesting is that she did not squander her inheritance, in terms of her qualities. She must have had a pretty smooth childhood. Vishesh, I guess she hasn't really excelled at anything in her life, although she is capable of it.